Darkvision: Atlanteans can see perfectly in the dark up to 60 ft.
Shards of the Past: Atlanteans have past lives that grant them two particular skills. Each member of this race picks two skills. The member of this race gains a +2 racial bonus on both of these skills, and those skills are treated as class skills regardless of what class the member of this race actually takes. Replaces skilled. Water-touched: Atlanteans gain the following abilities At Will: water-walk (Su), water breathing (Ex). Replaces atlantean magic. Natural Armor: Atlanteans gain a +1 natural armor bonus. Replaces darkvision. Elemental Resistance: Atlanteans gain a resistance to acid, cold and electricity resistance 5. Replaces fleshshaper. 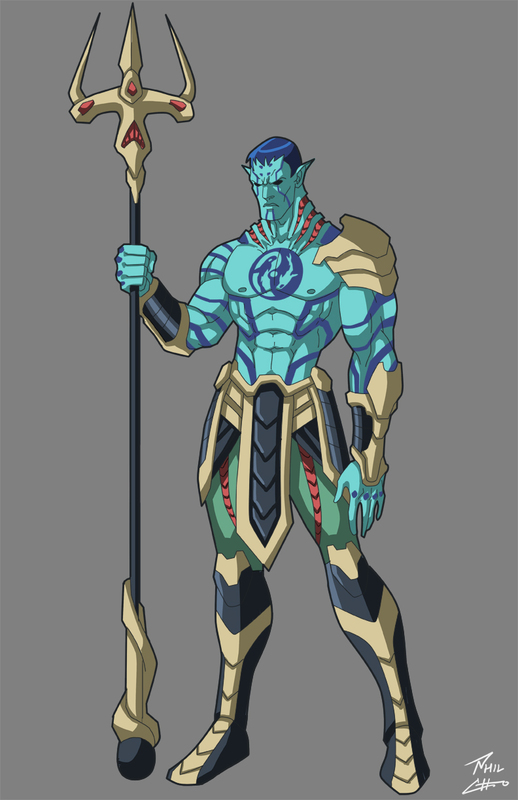 Atlanteans are descended from a union between an Elder water elemental and a mortal, but this is lost to legend. They are a calm, orderly people that rarely show emotion with extremely long lives. Naturally curious, they are often amused by the actions of short-lived outsiders. When pursing a goal, they are relentless but prefer to take their time and look a very broad perspective. Physically, they are short and slim; averaging around 5’6” and weighing about 125 lbs. Men and women are of similar height and build. Their coloration is olive skinned with dark hair; with fine, delicate features that is considered eerily beautiful by other races. Facial hair is uncommon unless there from interbreeding. Atlanteans are extremely long-lived, they are still mortal. The passage of time and the Mage Wars has diluted their outsider blood, which has shortened and weakened the blood of their descendants; the Atlans. A few, however, remain blessed by their elemental blood (or are still alive from before coming to this world). Due to their long life spans, many humans believe this plane-touched race is truly immortal. Atlanteans mature at the same rate as Atlans, but their life spans are 20 times as long. Atlanteans age similar to Astralus; for about 75 years, during which time they mature slowly, rarely growing over 4’ 5” or heavier than 65 lbs. During their long childhood they commonly apprentice themselves to different mentors to find their path in life. They reach adolescence around 75-100 years of age. This is when they become physically mature, reaching their full height before adulthood. Atlanteans can live up to 400 years. They consider most other humanoids (except elves) as unrefined barbarians and refuse to think that they are any threat to them. Humans in their kingdom are little more than second class citizens (a few are still under their control, that have not degenerates after the Mage Wars) and are commonly slaves, although if they show merit, their lot in life can be advanced upwards.